5 How Effective is Zovirax? Zovirax is a popular medicine for treating herpes. Does it work? Zovirax is one of the trade names for the drug acyclovir. Zovirax is an anti-viral drug. It is one of the most common treatment options for controlling and relieving the symptoms of herpes, as well as other conditions that may benefit from antiviral therapy. Like many antivirals, Zovirax is not limited to herpes treatments. It may also be beneficial for Epstein Bar, Chicken Pox, Shingles, and potentially HIV progression. However, it is most effective at fighting the herpes simplex virus, both HSV-1 and HSV-2. Zovirax may be used to reduce symptoms and improve recovery time during outbreaks of herpes simplex, particularly during more symptomatic outbreaks and primary infections. Zovirax may also be used as a suppressive therapy to reduce recurrences. Zovirax may come in an ointment or cream. These creams are applied directly to the surface of the skin at the site of infection. These ointments are most effective during the prodromal period, but may help reduce symptoms at any point during an outbreak. Topical Zovirax may be used for genital outbreaks if prescribed by a doctor, but are primarily used for HSV-1 outbreaks/cold sores. Topical Zovirax needs to be used often – sometimes as much as 6 times a day for 7 days. Side effects of topical treatments include itching or burning, redness, skin peeling, and possibly allergic reaction. The FDA released a statement regarding Zovirax ointments. 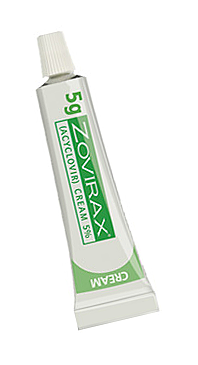 In the statement it claims that Zovirax ointment is not effective at reducing viral shedding or transmission, indicating that ointments should not be used as a suppressive therapy for recurrent or shedding herpes. Oral Zovirax is more common than topical Zovirax, and used to treat both HSV-1 and HSV-2. Oral Zovirax may also be taken 2 to 5 times per day, due to low bioavailability. Oral Zovirax may also be used for herpes suppression, particularly to reduce the likelihood of a recurrence. It also protects against asymptomatic viral shedding (transmission of herpes when no signs or symptoms are present), so it is possible to use it as a suppressive therapy. However, spreading herpes may still be possible. Common side effects include headache, nausea, and vomiting. In less common cases, an injection or intravenous Zovirax treatment may be necessary. The most common reason to use a Zovirax injection is with immunocompromised patients and those with severe symptoms, particularly in primary infections. Injections may also be used on neonatal patients and those with herpes encephalitis. Acyclovir has been heavily researched, and most studies show a very positive response. A study at the University of Washington compared acyclovir to placebo with regards to shedding and recurrence rates. According to this research, Zovirax was considerably more effective at reducing clinical viral shedding than placebo. Studies have also shown that Zovirax is an effective treatment during primary herpes outbreaks to reduce the severity of the symptoms. Clinical trials on Zovirax found that those that took the oral medication 5 times per day for 10 days experienced less pain and less duration of the initial herpes outbreak. A follow up study by the FDC and GlaxoSmithKline found that viral shedding was also reduced, with a mean healing time of five days when taken during the prodromal phase of the herpes outbreak (when the skin tingles without other accompanying symptoms). Without treatment, primary herpes outbreaks may last as long as 2 to 3 weeks. Shorter recurrent outbreaks of herpes by as much as 1 to 2 days. Increased the speed at which the lesions healed. Reduced pain by as much as one day compared to placebo. Prevented viral shedding at a significantly faster rate. Stopped the progression of the lesions in some patients. Several studies have also looked to see if Zovirax helped reduce HIV transmission. Many of those with HIV also carry the HSV-2 virus, and HSV-2 is known to increase the plasma level of HIV, potentially increasing transmission rate. Unfortunately, daily suppressive Zovirax therapy did not appear to reduce HIV transmission in those with both viruses. Also, those carrying the HIV virus may suffer from Zovirax resistant HSV-2. Acyclovir resistant HSV-2 is rare, but does appear to affect some of those that taken Zovirax regularly, particularly in patients that have tested positive for HIV. Zovirax and Valtrex are the two most common medicines for herpes outbreaks. Both are prescribed to reduce the symptoms of herpes, decrease recurrence frequency, and possibly prevent viral shedding, especially asymptomatic viral shedding. 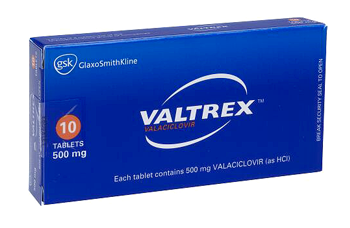 Valtrex utilizes a drug known as valacyclovir. Valacyclovir is actually a precursor to acyclovir, and converts to acyclovir (the same drug as Zovirax) once ingested in the body. As a result, the two share nearly identical success rates. All or most research shows that they are both equally as effective at reducing viral shedding, symptoms and recurrence frequency. The main difference between the two is dosing. Zovirax requires multiple doses per day – sometimes as many as 5 per day depending on body type and frequency of symptoms. Valtrex, on the other hand, is only taken once or twice per day. That is why Veltrex is now recommended more often for those with HSV-1 and HSV-2, in order to ensure that the patient is able to keep to the dosages. Zovirax is a generally safe anti-viral with minimal side effects that research has shown is effective at reducing the severity of herpes symptoms and preventing frequent recurrences and shedding. Zovirax may not be right for everyone, and does not completely prevent all recurrences or shedding, so it is still possible to experience symptoms or spread herpes to a partner. But overall Zovirax is an effective choice for reducing the damage of living with herpes.